There’s no need to refer to Britta Johnson as an emerging artist anymore. Her chamber musical Life After is a mature, fully-fledged work, rich in musical and psychological complexity that places her in the ranks of other great post-Sondheimian creators like Adam Guettel and Jason Robert Brown. The musical first appeared at the 2016 Toronto Fringe Festival but has since been reworked. Amazingly, it delves deeper into the human condition in only 75 minutes than most contemporary musicals twice that length. The central figure of Johnson’s work is Alice (Ellen Denny), a 16-year-old girl who is still mourning the recent death of her father in a car crash. Accommodating herself to his death is difficult for Alice because she and her father parted after one of the first substantive arguments they’d ever had. Alice keeps replaying a phone message he left her asking to make up, but she never phoned him back. Her grief is thus compounded with guilt and the turmoil of a conflict left unresolved. One of several non-traditional devices Johnson uses is to have Alice’s father Frank (Dan Chameroy) appear as a character periodically throughout the action. Sometimes he is a figure in Alice’s present imagination or in her memory of the past that only she can see. Sometimes he appears in flashbacks when alive and can be seen by everyone. The fact that Frank can appear in both in the past and in Alice’s mind is a key to the musical’s profundity. Now that Frank is physically gone, Alice struggles between remembering him as she knew him and reconciling that with new information she discovers about him after his death. Alice discovers that she is mourning someone about whom she knew very little. One fact Alice can’t understand is that in his final message Frank had said that he had to catch a plane leaving at 8pm. Yet, his died in a car crash far from the airport at 8:22pm. Johnson thus has Alice delve into the past in two ways. In one Alice tries to solve the mystery of the discrepancy of time and place in Frank’s message. In the other she tries to recall images of her life with Frank that will help her to move on. What Alice finds especially jarring is that everyone else around has already moved on. Alice wants to keep Frank’s office exactly the same as it was as a kind of memorial to him, whereas her mother Beth (Tracy Michailidis) is ready to paint it. Alice’s sister Kate (Rielle Braid) is impatient with her sister’s continuing sullenness. Meanwhile, only Alice’s high school teacher Ms. Hopkins (Trish Lindström) seems sympathetic. Alice’s bubbly best friend Hannah (Kelsey Verzotti) is more into distracting Alice with her humorous stories than in quiet empathizing. One of Johnson’s greatest inventions is to use a three-woman chorus (Neema Bickersteth, Barbara Fulton and Anika Johnson) to represent the superficial, ever-cheering, uncaring outside world whose signature remark about anything, whether it is Alice’s birthday party or a bench erected as a memorial to Frank, is “Wow!” Johnson weaves them all through the action in girl-group three-part harmony as a sign of how how alienated Alice is in her grief from the carefree world of others. Johnson’s musical is beautifully structured. It moves from Alice’s being nearly mute from grief and singing very little to gradually singing more and more until the final resolution when she sings her most extended music in her freest tones having reconciled herself to the past in her own way and in so doing having found her own voice, both literally and figuratively. In a pop-music variation on Wagner’s use of the Leitmotiv, Johnson gives each character or group of characters like the chorus a signature song that returns every time the character or group reappears, except that each time the song has slightly altered to suit the altered situation. The chorus’s “Wow!” tune changes the least each time reflecting its superficial world view. Beth’s tune changes little showing the singular rut her mind is stuck in. Alice’s changes the most, in fact changing, like Frank’s, by the end into entirely different songs. The two have found their own way of living with each other and so have literally “changed their tune”. Johnson experiments with unusual harmonies and dissonance, but perhaps the most daring feature of the musical is a long interval of complete silence from both the singers and the orchestra during which Alice, Kate and Beth very movingly come to an understanding. awareness and contentment, her voice increasing in richness and power with each step. It’s good to hear Dan Chameroy after his stint as Miss Trunchbull in Matilda the Musical singing again in his smooth, virile crooner-like voice. He can be brash as becomes Frank, who is a popular self-help guru, whose book-flogging and seminars take him so often away from his family. And he can be meltingly humble as a father all too aware of his failings. 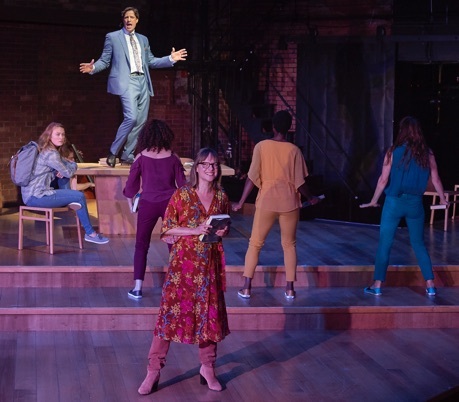 The deeply-felt duet “Poetry” between Denny and Chameroy is both the musical apex and the dramatic climax of the musical. All the other cast members shine. 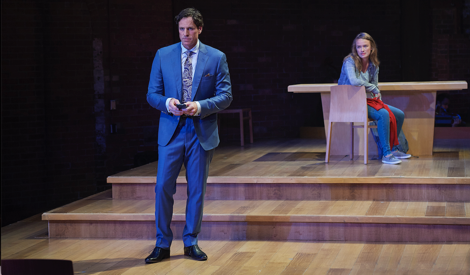 Tracy Michailidis as Beth and Trish Lindström as Ms. Hopkins communicate smothered grief in very different ways – Michailidis with anger, Lindström with resignation. Rielle Braid as Kate and Kelsey Verzotti as Hannah add humour to the show in very different ways – Braid with self-concern over her veganism, Verzotti with her embarrassing stories. The female trio of Neema Bickersteth, Barbara Fulton and Anika Johnson blend perfectly and move together as one as befits a group symbolizing conformity and everyday normality. Brandon Kleiman’s tiered wooden set thrusts like a shard into the Berkeley Street audience dividing it into two sections. Ming Wong’s costumes include colour-coding that lends a universality to Johnson’s very specific story. The female trio are clad in versions of three primary colours – red, blue and yellow. Beth, in contrast, is clad in a wheaten beige not unlike the colour she wants to use to paint over Frank’s office. Both Frank and Alice are dressed in similar colours of grey and blue to show their underlying affinity. Reza Jacobs leads the score from the piano in Lynne Shankel’s lovely orchestration for piano quintet and percussion that brings out all the quicksilver changes of mood and musical styles in the piece and, especially through its use of the strings, its underlying feeling of melancholy. The effect Johnson’s musical gives is not of a succession of numbers but of a series of individual melodies inextricably woven together. Johnson’s method ably reflects her musical’s view of the complexity of human relations while it also helps expand the form of the musical beyond its traditional boundaries. Life After is a show for lovers of music, theatre as well as music theatre. Like Come From Away it represents a giant step forward for musical theatre in Canada. Photos: Dan Chameroy as Frank and Ellen Denny as Alice; Ellen Denny, Dan Chameroy, Trish Lindström as Ms. Hopkins with Chorus; Dan Chameroy and Ellen Denny. ©2075 Michael Cooper.